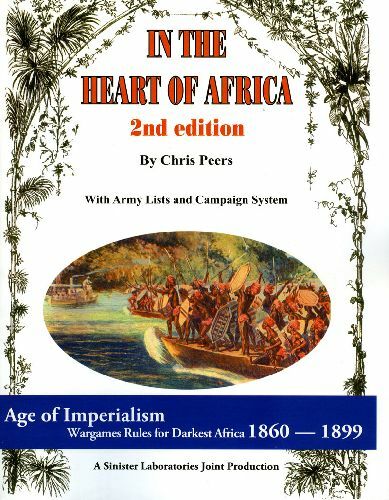 In The Heart Of Africa is a set of fast-play wargames rules for the period of exploration and imperial conquest in tropical Africa. Chronologically this corresponds roughly to the second half of the 19th century, while geographically it covers the region between the Zambezi River in the south, and the edge of the Sahara Desert in the north – the classic “Darkest Africa” of the explorers. Over the last few years this has become an increasingly popular period for skirmishing, role playing, and conventional wargames. This is not surprising, as it has a number of unique advantages. It rivals the ancient and medieval periods in the enormous variety of possible armies, each with its own distinctive - and often spectacular - appearance. It shares the “Boy’s Own Adventure” atmosphere of ordinary colonial gaming, but is far more interesting as a game: the Africans have more tactical options to choose from than the Zulu or Dervish charge, while the Europeans have a less decisive advantage in weaponry. And unlike many exotic and colourful periods it is relatively well known and accessible, with plenty of primary sources available in English – Livingstone, Stanley and several others are still household names to this day. The rulebook contains contains several basic army lists and a campaign system. This book is put out by Sinister Laboratories, a joint venture between Rattrap Productions LLC and Brigade Games and Hobby LLP.